Dong Quai, Angelica sinensis, is also known as Chinese Angelica. Dong Quai is one of the most commonly used herbal ingredients in China. The dried root has the ability to balance female hormones. 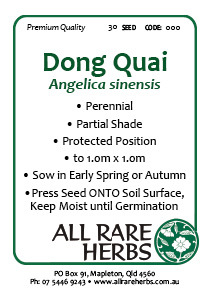 Dong Quai is native to east Asia and prefers moist, well-drained soils in a partially shaded. protected position. Frost and drought resistant. A perennial plant, growing to 1m x 1m. Be the first to review “Dong Quai, seed” Click here to cancel reply.